Save time and discover the advantages of modular sauna rooms instead of building a custom design! This class of pre-fabricated saunas can be purchased from just about any dealer either online or at a brick-and-mortar store, but for attractiveness and ease of installation, many of our favorite prebuilt saunas are manufactured by the DreamLine Company located in Pennsylvania. 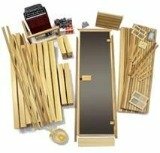 Kit includes everything you need: wall panels, moldings, trim, heater and controls, light fixture, pre-hung door, pre-assembled benches and back supports, and duckboard flooring. 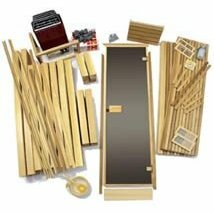 The kit assembles easily with prefabricated panels that lock together in minutes. The wood is made from light, honey-colored European Alder. In addition, the walls in prebuilt saunas have built-in vents for proper air circulation. 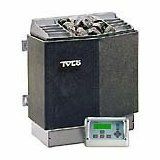 Premium heater, sauna rocks and heater guard are included. Accessories include wooden bucket and ladle, thermometer and wooden head rest. You supply the outside wiring (usually requiring 10/3 or 8/3 at 240 volts) but as for the unit itself, the wiring for the sauna heater, control panel, and lights are inside the walls. Dreamline currently offers over seven modular sauna rooms ranging in size from 4' x 6' up to 8' x 10', and within each size you can choose up to six different layouts depending on the location of the door opening and the heater placement. These prebuilt home saunas come with a wood frame door with large glass view, or you can opt for a full glass door with bronze tint at no extra charge if you order a unit from the “Classic” model line. Many units also can be ordered with an optional window. 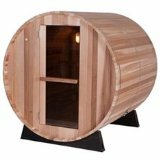 The difference in these modular or prebuilt indoor saunas from other competitors is that the wood is made from European Alder wood for the interior of the sauna as well as on all four exterior sides. Unlike the prevalence of Western Red Cedar used in most North American sauna construction, Dreamline uses Alder wood which is the wood of choice for sauna construction in Finland and many other European countries. 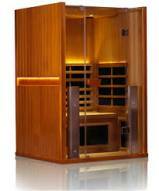 Dreamline’s prebuilt outdoor saunas do use Western Cedar which is a hardy aromatic wood that can stand up to the weather. The outdoor kits also include additional insulation as well as a roof kit. No matter which type, size or style of pre-fab kit you choose, check out the advantages that Dreamline modular sauna rooms offer and see how they have set the bar for the ultimate sauna experience.